Argentina is famous for its wine, beefsteak, tango, and a lifestyle with strong historical European influences that is unique on the continent. Argentina’s steady economic growth since the severe financial crash in 2001 has been a story of success. For many children, however, the future seems anything but bright. Located in the geographical centre of Argentina, Córdoba is the country’s second largest city and has a population of 1.3 million. Córdoba has been an important economic centre for a long time and is home to one of the most important financial districts in South America. From the 19th century, the city was a popular destination for many European immigrants, especially from Italy and Spain. Although the situation has been steadily improving in recent years, Argentine economy and society are still suffering from the consequences of the serious economic crisis that shook the nation in 2001. At the time, almost half the population fell into poverty. Thousands of people lost their jobs and their savings. Malnutrition, alcoholism and child abuse, as well as the phenomenon of street children, became increasingly common in formerly prosperous Argentina. Today, the problem of children without parental care living and working on the streets remains a highly visible problem in Córdoba – and not one that is met with sympathy from the population. These children and young people are often stigmatised and treated as criminals, simply for being on the streets. Essentially, this means that a certain criminalisation of poverty itself is taking place. Some measures and support programmes are in place to help these young people. However, for the healthy development and future of a child, it is essential that they receive support as soon as they are at risk of losing parental care. With support, it may be possible for the family to stay together. If it is not possible, the child needs a safe environment in which to complete their education and stay on course for a successful adult life. 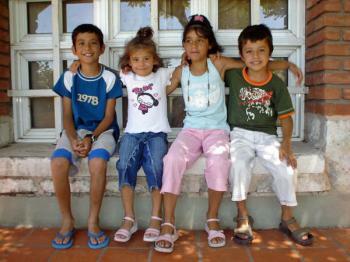 SOS Children’s Villages began its work in Córdoba in 2000. SOS families can provide a loving home to children who are no longer able to live with their parents. Children live here with their brothers and sisters, affectionately cared for by their SOS mothers. In February 2015, the families started moving out of the children’s village and into housing in the community. This way they are well integrated into the neighbourhood – they visit local schools and take part in community life. In cases where a judge decides that a child in our care should return to their family of origin, SOS Children’s Villages provides regular support to ensure that the conditions in the family are stable and that the child is well looked after. For young people who are ready to leave their family in order to pursue further education or vocational training, our SOS Youth Programme provides shared housing. Here, young people can plan their future, take on increasing responsibilities and prepare for an independent life, all the while supported by qualified youth counsellors.